2. Often some feel they bought the wrong house. With so little inventory on the market and bidding wars common, it’s easy to get swept up in the frenzy when five other people want the same house you’re looking at or when the limited options of homes to choose from gets frustrating. Focus on the positive for your situation and try not to listen to un-constructive, negative dialogue. Don’t let negative reactions from friends and family let you second-guess your decision. Make the house your home you love. If you would like to consider your options for buying a home, please contact Melody Pike Southern California Realtor who works in both residential houses and commercial apartment complexes. Realtor serving Orange, Los Angeles, San Bernardino and Riverside counties. 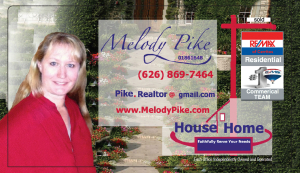 If you do not live in Southern California and would like help finding a local realtor in your area contact Melody Pike she has sold real estate in multiple states and will help you find a realtor in your area. What are the Clients saying about Melody Pike? Check out! ‹ A head start for first-time home buyers fall 2017 Southern California!